Spring is in the air; cue the music. Palatine Park District will host four concerts this weekend at Cutting Hall Performing Arts Center, 150 E. Wood Street, in Palatine. Spring Concert Weekend in Palatine will kick off on Friday, April 27 with “Friends and Lovers” by Allegro Community Chorus, followed by two “Festival of Song” performances by Palatine Children’s Chorus on Saturday, and Palatine Concert Band’s “Dance” will close out the weekend on Sunday afternoon. Palatine Children’s Chorus’s “Festival of Song” will be presented in two performances, the first at 1:00pm with all choir levels followed by a second performance at 3:30pm featuring Intermezzo, Concert, and Honors choirs. 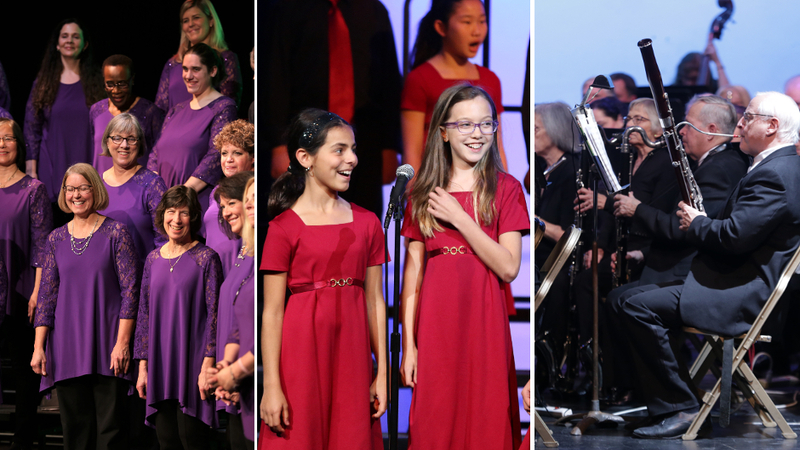 Palatine Children’s Chorus (also known as PCC) is made up of six levels, including Sing with Me for ages 4-5, Do Re Mi for ages 6-7, and Treble, Intermezzo, Concert, and Honors for ages 8-18. The mission of the chorus is to introduce all students to a variety of music and offer each level appropriate and safe vocal instruction and music education. Saturday’s concerts will be the final PCC performances for six seniors aging out of the program, including Jeremy Boyle, Emily Bushmole, Khloe Drahos, Anna Froehling, Becca Weeden, and Camilla Vazquez. Each of these singers has been in the chorus for over five years with a cumulative of over half a century. “Festival of Song” will also be Artistic Director Rachel Rosellini’s last with the chorus as she resigns her position for other new and exciting opportunities. Assistant Artistic Director Stevee Ballas will be stepping in as Artistic Director this summer. Under the direction of Dr. Frederick Lowe, Palatine Concert Band’s “Dance” will begin at 3:30pm on Sunday featuring a toe-tapping line up. Performance selections include “Dance Rhythms,” by Wallingford Riegger, “Suite from the Ballet Pineapple Poll” by Arthur Sullivan as arranged by Mackerras and Duthoit, “Danse Macabre” by Camille Saint-Saëns and translated by Mark H. Hindsley, “Glenn Miller in Concert” as arranged by Wayne Scott, and “Four Dances from West Side Story” by Leonard Bernstein as arranged by Ian Polster. Tickets for all performances are available for purchase online at cuttinghall.org. Prices range from $7.00 to $12.00 per person based on person types. Call the Cutting Hall Box Office at 847.202.5222 with any questions. Regular business hours are Wednesday through Saturday from 3:00pm to 6:00pm. The Box Office is also open one hour before each performance for door sales only. For more information about Palatine Park District choral music programs, contact Cultural Arts Coordinator Ashley Schiavone at 847.496.6237 or aschiavone@palatineparks.org. For information about Palatine Concert Band, visit palatineconcertband.org.